BASETRACK Live incorporates photographs, videos and interviews to tell the story of warfare, both at home and abroad. In the performance, an actress playing the wife of a Marine talks to her husband via Skype. BASETRACK Live is based on the experiences of A.J. Czubai, a Marine who fought in Afghanistan and whose post-traumatic stress disorder tears his marriage apart. Basetrack began as a place for embedded journalists to post photos. Later it became a social media site where families could keep up with their troops in Afghanistan. Now it has transformed again, into a new way for the most recent generation of veterans to tell the story of their service and survival. Run the site past a composer from Juilliard, add a combat vet-turned-actor, a string section and a DJ, and you get BASETRACK Live. "Not so much a play or a concert or art gallery," says Ed Bilous, the composer who created the project, "it represents ... not only a new kind of warfare, but also new way of creating art." BASETRACK Live starts like a video documentary, with interviews of Marines in Afghanistan projected on a screen behind the stage. Strings, a horn and percussion take cues from what the Marines are saying. Their tales from patrols in Afghanistan morph into hip-hop. 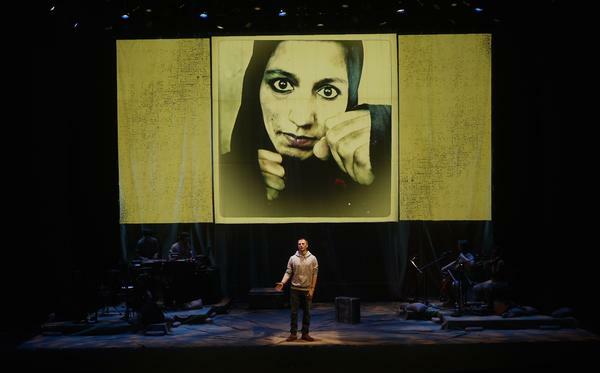 Amid the videos, the rap and music, an actor takes the stage, playing the part of a Marine in Afghanistan. An actress plays his wife back home — live via Skype to the theater. The actor in the current production touring the East Coast is Tyler LaMarr, himself a Marine veteran who served in Iraq, in Fallujah and Ramadi. "It does help that I'm a veteran — but this show is 100 percent authentic. Everything is verbatim text from interviews," says LaMarr. The story climaxes with the Marine in a firefight — and his wife giving birth to their daughter alone back home. He comes home after he gets wounded, and post-traumatic stress disorder and trouble adjusting rip his marriage apart. The character is based on A.J. Czubai, a former Marine. "Believe it or not, my story's actually pretty common among service members who deployed," he says. Czubai says it wasn't easy to let his story be made into a stage show, but he felt a duty to share his story of getting help for PTSD. "I was really hurting at the time and, at first, you know, I didn't want to share," he says. "It doesn't exactly show me in my best light. But if I could just show a couple people who are hurting you can make it out, then I'm extremely happy I did it." Most of the audience for BASETRACK Live won't be veterans, but people who want to know about their experience. The show's producers say that's the point. "We didn't want audiences walking away saying, 'Look at those poor guys,' or 'It's all a bunch of heroes,' or 'It's all a bunch of fanatics,' " says executive producer Anne Hamburger. "War changes ordinary people." On this Veterans Day, let's report on a different way to express the stories of war. We start with a social media site. It's called Basetrack. A journalist in Afghanistan started that site, and troops used it to exchange photos and messages with their families. The material on that site has now inspired Basetrack Live. 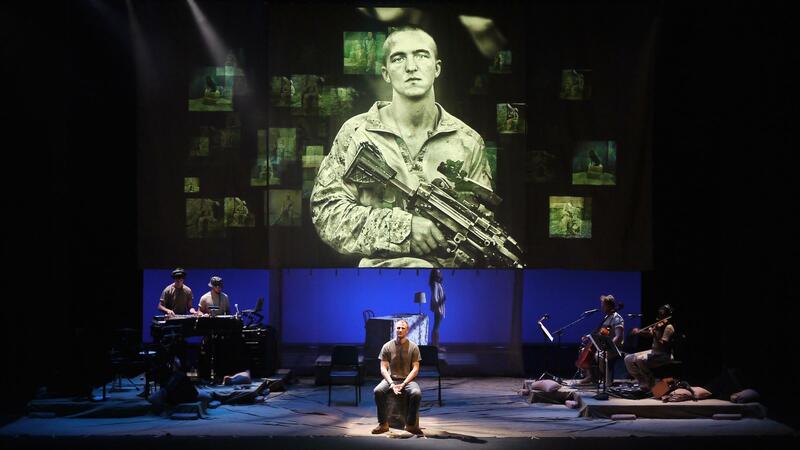 That is a stage show interpreted by a composer from Juilliard, a combat vet-turned-actor, a string section and a DJ. The show is touring the East Coast this month. NPR's Quil Lawrence reports. QUIL LAWRENCE, BYLINE: Basetrack Live starts like a video documentary. SERGEANT LOGAN FROMME: My name's Sgt. Logan Fromme. LAWRENCE: Strings, a horn and percussion take cues from what the Marines are saying. Their tales from patrols in Afghanistan morph into hip-hop. UNIDENTIFIED MAN: (Singing) Now, put your eyes down, put your eyes down, son. LAWRENCE: Scenes from Afghanistan are on video. On stage is an actor playing the part of A.J. Czubai, a Marine in Afghanistan. The actor is live on stage. 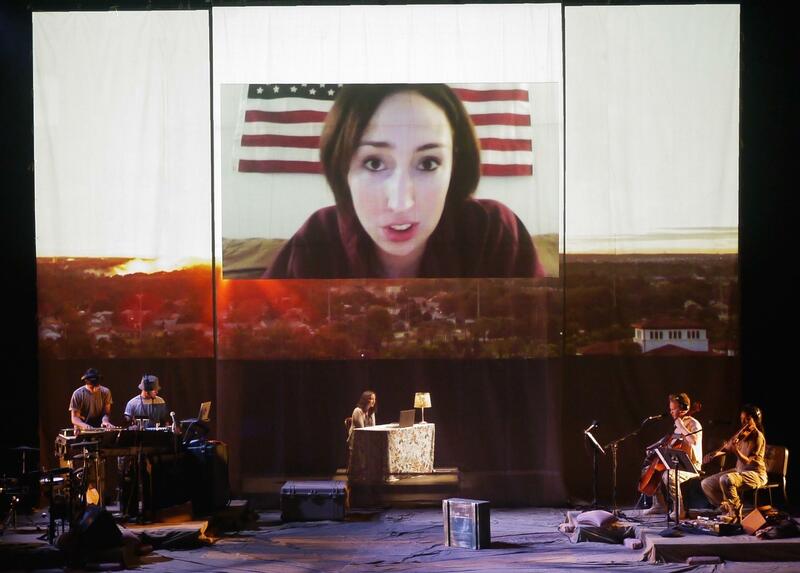 An actress plays his wife back home live via Skype to the theater. UNIDENTIFIED ACTRESS #1: (As Czubai's Wife) It's out of his control. It's all I can keep reminding myself. LAWRENCE: The story climaxes with Czubai in a firefight, with his wife giving birth to their daughter alone back home. UNIDENTIFIED ACTOR #1: (As A.J. Czubai) So I called, asked permission to end the mission. They said no. Stay put. [Bleep]. UNIDENTIFIED ACTRESS #1: (As Czubai's Wife) A.J. 's supposed to be here. UNIDENTIFIED ACTOR #1: (As A.J. Czubai) I looked at all my boys and they're just looking at me, and I'm like get ready. Boom, boom, boom, boom, boom, and everything just opens up. LAWRENCE: Czubai comes home after getting wounded and has trouble readjusting. Post-traumatic stress rips his marriage apart. A.J. CZUBAI: Believe it or not my story is actually pretty common among service members who've, you know, deployed. LAWRENCE: That's the real-life Marine A.J. Czubai. He says it wasn't an easy choice to let his story be told. CZUBAI: You know, I was really hurting at the time. And at first, you know, I didn't, like, want to share because, you know, it doesn't exactly show me in my best light. But, you know, if I could, like, just show a couple people who were hurting, you can make it out, then I'm extremely happy I did it. LAWRENCE: But most of the audience for Basetrack Live won't be veterans. It'll be people who want to know about their experience. The show's creators say they don't want people to pity these vets or think they're all heroes, just ordinary people changed by war. Quil Lawrence, NPR News. Transcript provided by NPR, Copyright NPR.